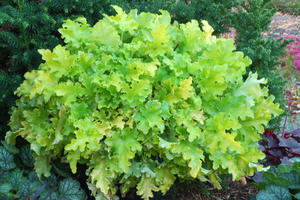 Heavily ruffled, lime green to chartreuse leaves form a compact, rounded clump. Tan colored flowers on short stalks in late spring. A sport of ‘Marmalade’ with smaller leaves.